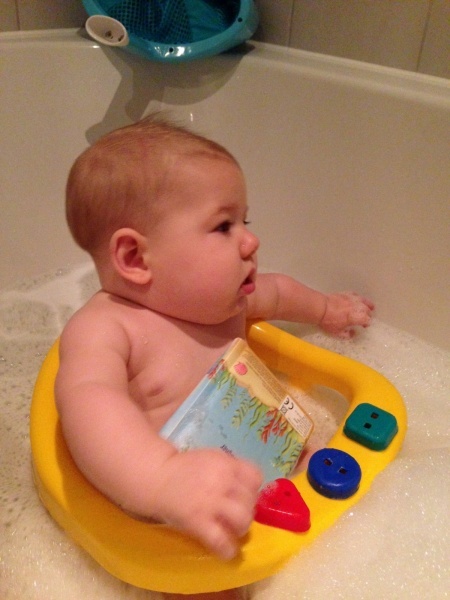 EssexBaby.co.uk was recently sent a DreamBaby Premium Deluxe Bath Seat to review by Simple Safety Solutions. We passed it over to one of the mums in our review team, who tried it out with her daughter and who has now written a review. If you’re thinking of buying a bath seat for your little one, take a read and see what she thinks! The Dreambaby® bath seat has a very sturdy design and has large suction cups underneath to keep it firmly rooted to the bath. My daughter is very confident in the bath and enjoyed using the bath seat, the front opening was easy to use and made it easier to get her out the bath. I can see that this product would be great for babies (and parents) who may be nervous about bath time. My little one has always preferred to lie down in the bath and move around a lot! The bath seat gave me peace of mind that she would not spontaneously rollover or try to stand. It also gave her more freedom to play with the bath toys. As mentioned the bath seat is sturdy but is also quite bulky. Even though it folds for storage, I still found it hard to store and it now lives in the airing cupboard when not in use. Although the suction cups are strong – which is a good safety feature – they do also make it hard to remove the seat from the bath. I have been struggling to bath Sebastian recently because he no longer wants to lay down in the bath but he is not sitting confidently enough to be comfortable in Eliza’s old bath seat. In fact he used to slide down in the seat and the back of the seat would dig into his neck as well as squishing his little boy bits plus it was a nightmare trying to get him in and out of it. 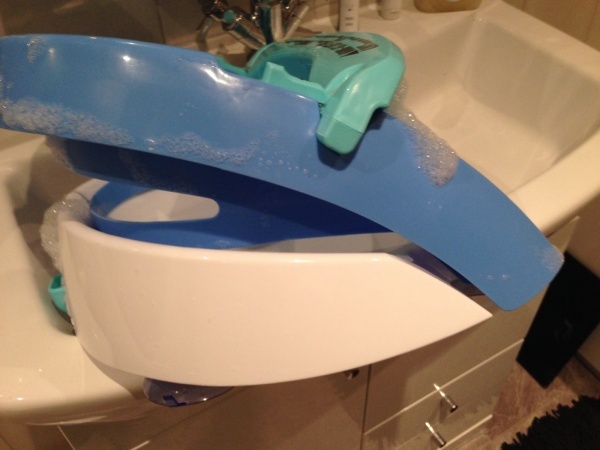 I was sent the new Dream Baby® Premium Bath Seat which promises to make it much easier to bath your baby – we couldn’t wait to put it through its paces. 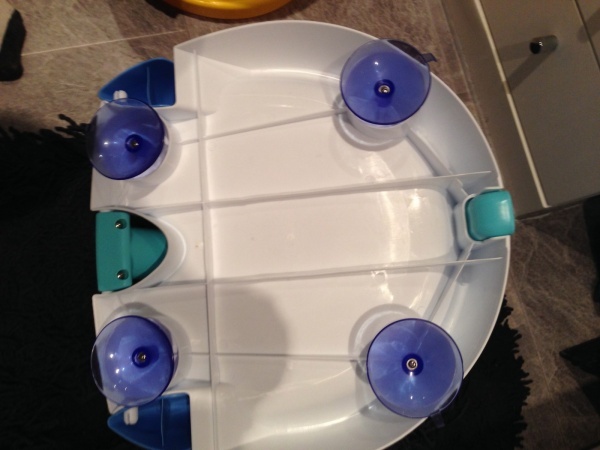 The seat contains 4 strong suction cups to secure the seat to the bath. If your bath has a non-slip resistant service you will also need to use the four discs supplied for proper suction. You need to push the seat down for about a minute to ensure it is secure, but once in position it doesn’t move. 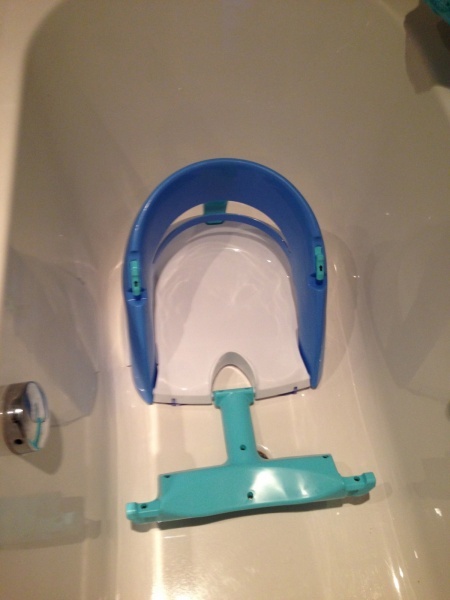 One of the first things I was drawn to was that the front support bar can be easily opened which simplifies the positioning of your baby whilst getting in & out of the bath seat. The front locking mechanism makes it secure for Sebastian whilst he is in the bath and the clips are easy to undo with one hand when it is time to get him out. The seat is suitable from around 6 months (when baby can sit up unassisted) to when baby is able to stand and the back support comes up much higher than that on a tradition baby bath seat. The Dream Baby® Premium Deluxe Bath Seat is lightweight and durable and in addition it can be easily folded for convenient storage, although it doesn’t fold as flat as I had hoped. This all looks fantastic so far, but how did Sebastian get on with it? It is safe to say that it is a resounding success. The higher back gives him the support he needs and the non-slip seat prevents him from slipping down. He loves being able to splash and giggle when talking to me or his big brother Kian plus the wide T-Bar comfortably supports his bath toys. When it is time to get him out the bath it is easy to undo the side clips one at a time which enables my other hand to ensure that he doesn’t lunge forward as I open it. 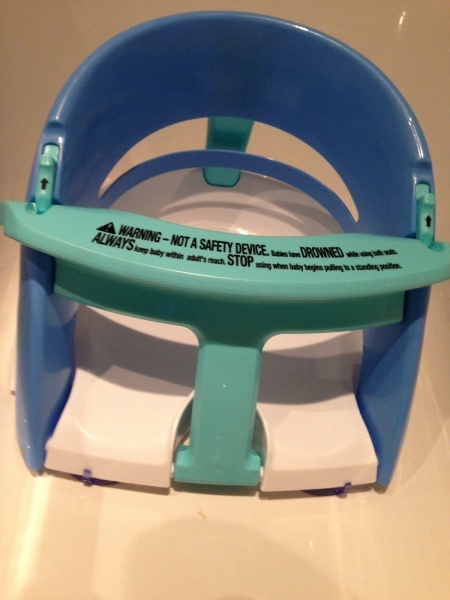 The bath seat is easily removable once finished too – simply pull the tags on the suckers to real ease the seat. The only minor disappointment is the fact that it is described as folding flat for easy storage, but in reality it doesn’t make much difference in size. DREAMBABY® LAUNCHES A NEW RANGE OF ON-TREND WOODEN GATES TO HELP KEEP LITTLE ONES SAFE AND SECURE IN THE HOME! WIN ONE OF SEVEN DREAMBABY® SAFETY GATES! A return to natural fibres, sustainable building methods and “warmer” interiors are evident via design and style key influencers this season. Wood is definitely “in” again, and is being increasingly used and championed by interior designers and lifestyle bloggers alike. The launch of Dreambaby®’s new range of wooden-inspired gates is very in keeping with this trend offering parents and carers a stylish safety option for their homes. The NEW Dreambaby® Murano Gate is made from wood and polycarbonate in a unique grey tint and has been designed with a stylish see through door panel; perfect for homes with an interior design mix of retro & contemporary. A one-handed opening & easy close system – just the thing for new parents, who never have enough hands! Swings open in both directions with the ability to change the opening direction (to be restricted to only one direction, depending on your needs). Fits openings up to 85.5cm. Extendable up to 101.5cm (40”) with extensions. call (02) 9386 4000 or in New Zealand, call (09) 274 8788. 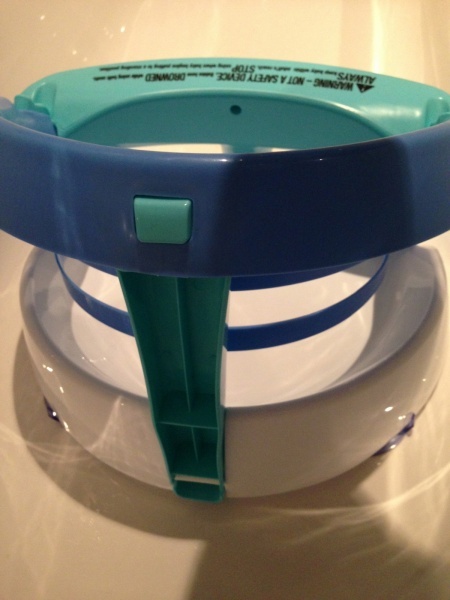 Become a Dreambaby® fan: http://www.facebook.com/Dreambabysafety. As a parent, when you have babies and toddlers around, it is crucial that you prepare your home and make it safe for them. With Wyatt, he is a little guy who is very curious. He is constantly exploring and with that he is always getting into anything and everything he can get his little hands on. So as a parent, I find that it is my job to try and ensure that he is safe when he is exploring. Recently I was sent a pack of products from Dreambaby to review and to also help me make my house a little safer for little hands! With the 26 Piece Home Safety Value Pack, I can put latches on the cabinets in my home that I do not need little Wyatt exploring in and also keep him safe from the appliances. Then with the Socket Covers, I can ensure that Wyatt is not trying to stick his fingers or any toys in the sockets around my home, and having the corner cushions helps to keep him from bumping into any sharp corners and hurting himself. Aside from the home safety pack, I was also sent some products for our blinds and cords. With the Blind Cord Wraps, I can keep the cords on our blinds up out of reach, to help prevent strangulation. I can also use the Cord Windups to keep the cords safe and out of reach. Well to help with keeping your little ones safe in your home, the wonderful people from Dreambaby would like to give one of my amazing readers their own Home Safety Products from Dreambaby! WIN A DREAMBABY® BLIND CORD SAFETY PACK FOR YOUR HOME Keeping blind cords out of reach of children should be on top of the “to-do” list in your family home. 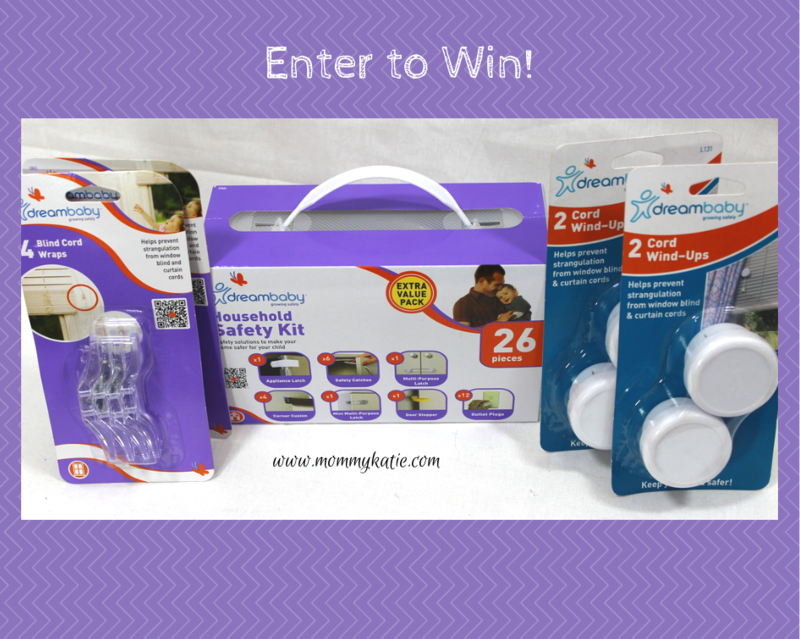 To help you create a safe and secure home, Dreambaby have TWO Blind Cord safety packs valued at over $39.00 each for you to win. A major safety hazard around the home is dangling curtain and blind cords. They can lead to serious – and sometimes fatal – injuries for small children. As parents, we can take action to prevent these accidents from happening. Move cots and beds away from window areas and then add an extra layer of security by tying up and securing blind and curtain cords using Dreambaby® Blind Cord Wrap and Dreambaby ® Blind Cord Wind- Ups. These are affordable and highly effective safety solutions that help keep your little ones safe from a very serious danger in the home. Dreambaby® is giving you the opportunity to ensure your blind cords are safely stored out of reach. Each pack contains; 2 x Blind Cord Wraps – 4 pack (F865) – $5.45 each 2 x Cord Wind Ups – 2 pack (F131) – $4.45 each 1 x 26 piece Household Safety Value Pack -$19.95 each Total prize pack = $39.75 each For more advice on child safety and for a chance to win further products become a Dreambaby® fan: http://www.facebook.com/Dreambabysafety. For your chance to win, simply comment below on your best Safety Tip for other Parents. The competition starts 1st March and ends at midnight on the 31st March 2014. There will be 2 individual winners, each of 1 Dreambaby Blind Cord Safety Pack valued at $39ea. You can enter as many times as you want. All entries will be judged on skill and chance takes no place in the judging process. Winners will be notified by Monday 7th April 2014. Tee- Zed Newsletter no 4. Childproofing the home is one of the biggest, most important tasks when raising a family. Almost everybody combats the obvious; hot stoves and sharp knives, poisonous chemicals and staircases, to name a few. There are some dangers which slip our minds because they may not seem harmful to us – but they can be deadly for some young children. There are “modern-day hazards” including small remote controls, magnets, batteries and treadmills, but there are also plenty of traditional items of furniture which can cause injury. One such hazard in the home is curtain and blind cords. While cords are easily forgotten for us, they can lead to serious – and sometimes fatal – injuries with small children. Last week, two Sydney families suffered from horrific tragedies when their children strangled to death on blind cords. A 15-month-old was strangled by on a blind cord in Quakers Hill, NSW recently, and a 16-month-old from Hornsby, NSW died after being entangled in a cord while she slept. Devastating incidents like these should act as serious wake up calls for the rest of us. We should take action to prevent such an accident from ever happening again. Of course, we cannot protect our young from every possible hazard which comes its way. Some accidents are unavoidable, but not all. We can work hard to prevent avoidable accidents and injuries. Some can be avoided using common sense and learning from error, while others can be avoided using simple, effective and affordable household safety items. Last year, an 18-month-old boy also died after being accidentally strangled in his sleep by a blind cord. Unaware of the danger, the cot was placed next to a window with vertical blinds. His parents later issued a warning to others about the danger of “something so silly,” which has changed their lives forever. “My biggest message would be check the layout of the room and then while you’re in there give them a big kiss, because that’s what we miss,” said the boys mother, Linda Mackay. While statistics regularly show that there has been a vast improvement in prevention of injury and accidental death, they do still occur regularly. Being careful means more than driving slowly, turning off hot water, and locking away chemicals. It also means checking every corner of the house for potential danger, and doing everything possible to avoid injury. Tragic stories such as these remind us that we need to continue being careful and safe around the home. Always ensure that blind or curtain cords are safely concealed, particularly in an unattended bedroom. 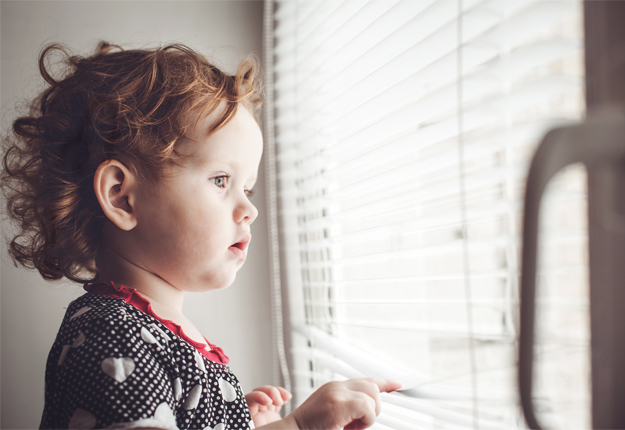 Items such as the Dreambaby ® Blind Cord Wrap and Blind Cord Wind- Ups are an affordable and highly effective example of how to keep your little ones safe from a serious danger in the home.